The upcoming holiday season has me thinking about seasonal get-togethers. Here’s a benefit auction item idea fitting to the season. Similarly, some bridal showers (co-ed) are “stock the bar” parties. The idea is for guests to bring the happy, soon-to-be-hitched couple all the wine, spirits and related accouterments they need to stock the bar for future entertaining of friends and family. 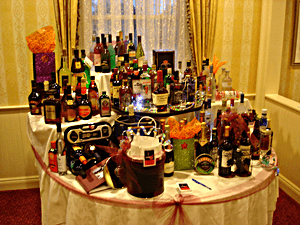 With a benefit auction, the usual “stock the bar”-type of party is a pre-party held a month or so before the gala. A few of my clients host a party, which consists of heavy hors d’oeuvres and a wine tasting. The entry fee for that event is a bottle of wine valued at, say, $30 or more. The bottles of wine are then sold at the gala, sometimes in one lot and other times via different auction games involving wine. If your crowd is more of a spirits crowd than a wine crowd, you might enjoy an adaptation of this activity. Alter the wine donations to a pure bar party. One way to conduct the party is to ask guests to bring whatever they want ... wine, spirits, glasses, wine openers, olives, etc. It’s their choice. If you end up with 5 bottles of Bailey’s Irish Cream, so be it. So in my case — with the last name of Truhlar — I might bring tequila, Tennessee whiskey, Tanqueray gin, or triple sec … and some toothpicks thrown in for good measure. By the time everyone arrives with their items, you will have a completely stocked bar, ready to sell at your gala. Check with your State laws regarding selling/raffle/aution of spirits and wine at auctions.